The 7 days of Holy Week, leading to the joy of Easter Day, are the most important in the Christian year. We remember the final week of Jesus' life - sharing his last supper with his friends, washing their feet, betrayed by them, arrested, tortured and crucified, and all seemed lost - until the glory of Easter Day, when Jesus rose again, and revealed that life is stronger than death. working to bring hope, life and love out of death and despair. in his glorious resurrection to a new, transformed life. 7.00pm Upchurch Choral Society - Laudate Dominum at St. Mary.s Upchurch. 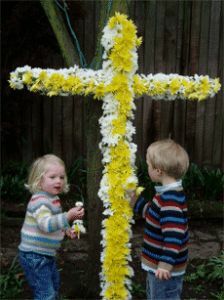 Sunday, 21st April, EASTER DAY - many different services at our six churches on this joy-filled Christian festival. Click here for details.